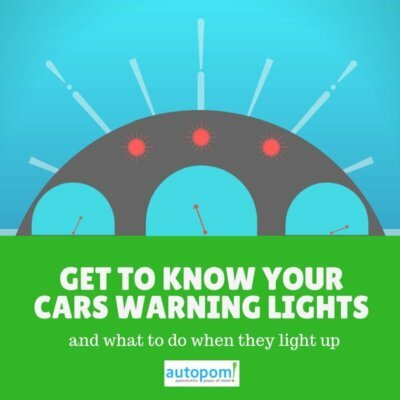 Each one of your car warning lights is there for a purpose. They tell you something important about your vehicle, so it can be both unwise and costly to ignore what they are trying to say. Some lights require immediate attention – as in “get off the road right away or you might find yourself in a very inconvenient (or expensive) situation.” However, others can wait a few days until your mechanic has an opening. Part of proper maintenance and care is knowing what each of the car warning lights means for your particular vehicle. Although many symbols are standard, some manufacturers will use slight variations so it is important that you read the owner’s manual to familiarize yourself with the dashboard. Believe me, you will want to know what the glowing red thermometer means before steam starts pouring out from under your hood, especially if you are in the middle of a crowded highway and have to cross over three lanes of traffic to get to safety. Your vehicle is programmed to communicate with you, but the system only works if you are paying attention. Car warning lights indicate a problem. It may be a small one that can be easily fixed, or it may be a major mechanical failure. Ignoring these lights is foolish because a simple issue can quickly turn into a serious repair. Do you want to maintain a strong – and long – relationship between you and your vehicle? Then listen to your car and know how to react appropriately. In most vehicles, all car warning lights will come on when the vehicle is first started. This is part of the built-in self-check program and they will automatically shut off within a few seconds. A light that remains on or comes on while driving may indicate a problem. Seatbelt Reminder – symbol: a person wearing a seatbelt. This light will be activated as soon as the car is moving if the driver or front passenger is not wearing a seatbelt. It will remain lit until seatbelts are fastened. Some vehicles also have a warning bell to accompany the light. Brake System Alert – symbol: exclamation mark in a circle – May also have the word “BRAKE” below. This light indicates possible problems with the braking system such as low brake fluid, loss of hydraulic pressure, leaks, or worn pads. When this light comes on you should have your vehicle checked as soon as possible, especially if you notice any changes in braking ability. Parking Brake Alert – symbol: a circle with a “P” inside. This light illuminates when the parking brake is engaged. If the light remains lit after the brake is released or comes on while driving, stop driving the car right away and have your vehicle checked by a professional. If you are unable to cease driving immediately, exercise extreme caution until you are able to get your car to safety. Antilock Brake Warning Light – symbol: a circle with “ABS” inside. This light will appear if there is a problem with your antilock braking system. Your regular brakes will continue to work normally; however, you will not have the ABS safety feature if you have to stop suddenly or brake on slippery roads. Although this light does not indicate an immediate risk to your safety, you should have the vehicle checked by a professional as soon as possible. And, in the meantime, remember to drive with extra caution in braking conditions where the ABS system would normally be engaged. Temperature Warning Light – symbol: thermometer in water. This light will appear if the engine coolant rises above a specified temperature as a way of warning the driver about possible engine overheating. Stop driving immediately – or as soon as you can safely pull onto the side of the road. Continuing to drive with an overheated engine can be dangerous and may lead to very expensive repairs. The most common explanation for this light is a low coolant level, so when the engine is cool (never remove the radiator cap on a hot engine) check the coolant and add more if necessary. It is recommended that you always have an extra container of coolant in your car for such situations since having to call for roadside service can be costly (unless you have a vehicle protection plan, of course) and time-consuming. Some vehicles have a temperature gauge rather than a light, and you need to stop driving the car when the dial reaches the red zone. Oil Pressure Warning Light – symbol: jug or kettle shaped container with a drop of liquid coming out of the spout. This light usually indicates low engine oil pressure. Continuing to drive a car with insufficient oil pressure can cause serious damage to the engine, so pull off the road and turn off the car as soon as possible. The most common explanation for this light is low oil, so with the car turned off, check the oil level and add if necessary. If the light appears or remains on even with an adequate oil level, you need to have the car inspected by a mechanic before driving it again. Battery Warning Light – symbol: battery. This light will illuminate when there is a problem with your vehicles generator or charging system which is designed to charge your battery when your car is turned on. If this system malfunctions, your battery will eventually drain and your vehicle will stop running. If this light appears while you are moving, pull off the road as soon as safely possible. Shut off all accessories to conserve power and don’t turn your vehicle off until you reach safety or it may not restart again. Visit your mechanic as soon as possible to have the problem identified and repaired. Low Coolant Level Warning Light – symbol: box with an arrow inside pointing downward toward a wavy line. This light will appear when the coolant level is low. Add coolant as soon as possible – immediately if the engine temperature rises or the temperature warning light illuminates. If the light remains on after adding coolant, have your vehicle inspected by a mechanic. Low Fuel Warning Light – symbol: fuel pump. This light indicates that the fuel tank is close to empty. Refuel as soon as possible. Check your owners manual to verify how much gas is remaining (or how far you can still drive) once this light comes on so you don’t end up stranded on the side of the road. Check Engine Light – symbol: engine, or the words “Check Engine.” This light indicates a potential problem with the emissions system. Usually, your vehicle will continue to run and you will be able to drive it until you can arrange an appointment with your mechanic. However, the check engine light may also come on in the event of a more serious issue such as a malfunctioning sensor or catalytic converter, so leaving the situation unattended for too long may lead to major or expensive repairs. Note: In some vehicles, the check engine light will illuminate if the gas cap is loose. Before taking your vehicle to a repair shop, try tightening the gas cap to see if this fixes the problem. Service Light – symbol: wrench, wrench inside a car, or “service engine soon”. The appearance of these symbols could mean many different things depending on your vehicle. Sometimes, they may indicate a non-emissions related problem with the engine or they may simply be telling the driver that the vehicle is due for an oil change. Some cars will have a separate “change oil soon” light, while others use a “Service Light” alongside a “Check Engine Light”. Refer to your owner’s manual to find out what each symbol indicates for your specific vehicle. Traction Control Light – symbol: back of a vehicle with wavy lines below/behind the tires. This light will flash when the traction/stability control system is engaged. This informs the driver that the vehicle has encountered dangerous conditions and is working to avoid a skid or rollover. If you see this symbol appear, you should drive more cautiously for the conditions. ESP/BAS Light – symbol: letters “ESP” above the letters “BAS”. If your vehicle has this light, its appearance usually means a problem with the electronic stability control and/or brake assist systems. Have the car looked at by a professional who can correctly identify and correct the issue. All Wheel Drive Light – symbol: AWD. This light indicates that the all-wheel-drive system is activated. Open Doors Light – symbol: a car with doors open. This light will illuminate when one or more of the vehicle’s doors is closed incorrectly. It will usually go out when the doors are shut properly. Trunk Lid Open Light – symbol: a car with an open trunk lid. This light will appear when the trunk is not closed properly and will go out once the trunk is correctly latched. Tire Pressure Monitoring System Light – symbol: semi-circle or horseshoe-shaped symbol with an exclamation mark inside. This light illuminates to warn the driver of low pressure in one or more of the tires. This will affect the cars handling and can be potentially dangerous. Air your tires up as soon as possible. Engine Power Restriction Light – symbol: engine with a downward pointing arrow inside. Some vehicles will restrict engine power if there is a malfunction so that you will not be able to exceed a certain speed until the problem is repaired. Have the car checked out immediately. The sooner the issue is fixed, the sooner you will be able to drive the speed limit again. Front Airbag Light – symbol – side profile of a person wearing a seatbelt with a round circle or ball on their lap. Most cars have a sensor that will let the vehicle know if someone is sitting in the front seat so the airbag can be activated or armed. When this light is flashing, it may indicate that there is a problem with the sensor or the airbag system. In this case, your airbag may not inflate in the event of a crash. Take your vehicle to a mechanic as soon as possible to have the system inspected and the light reset. Car warning lights are your vehicle’s way of letting you know that there is something wrong. When you know what each symbol means you will be better prepared to respond properly and possibly avoid expensive repairs. If the thought of costly or unexpected mechanical failure is stressful, consider purchasing a vehicle service plan that will come to your assistance – wherever you happen to be – whenever one of those car warning lights make an untimely appearance. See “What Do The Lights On My Dashboard Mean?’ for an informative infographic.